We stock'em all. Great as Mouse Pads or Placemats too! space. Have fun and learn while you work on your guns. 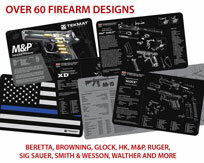 Looking for Illustrated Disassembly/Reassembly & Reloading Gun-Guides? Click Here. Click here for Bore-Stores Gun Mats. Click here for the Lyman Essential Gun Mat.